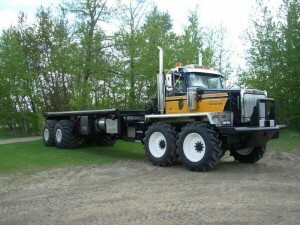 Allnite Trucking Ltd is a specialized transportation company operating in Alberta’s oil and gas sector since January 1990. Allnite Trucking Ltd. grew as it aided the expansion of the gas and oil industry in all areas of Alberta, East and Southern Saskatchewan, Northern British Columbia, and the Territories. The company grew from one man/one truck, to an organization of passionate individuals that carry on the dedication of customer service and commitment to safety. Based in Boyle Alberta on Highway 63, Allnite Trucking Ltd.is centralized to service the oil and gas industry in Northern Alberta. We have quick and direct access to Edmonton, Calgary, and Fort McMurray which makes our customers logistic solutions fast and easy. We operate a fleet of trucks ranging from pilot cars, hot shot units, highway tractors, winch trucks, 30-40 ton pickers, and up to 400’’ 8X8 bed trucks. Trailer configurations range from tandem hot shot trailers, tri axles, 16 & 24 wheelers, and up to 48 wheel combinations. Allnite Trucking Ltd’s dedication to customer service and safety has always been first and foremost. The continued growth of the company has proven these strong values will continue to benefit this strong pioneering company and all of its customers and employees.